Composting is a process by which organisms break down organic materials (e.g. food scraps, leaves, lawn clippings, etc.) into smaller sizes and in the form of nutrients that can be taken up by plants. In forests, leaves and woody debris naturally break down by the actions of insects and other invertebrates, bacteria, and fungi to form the upper layers of the soil. Composting is the same process. 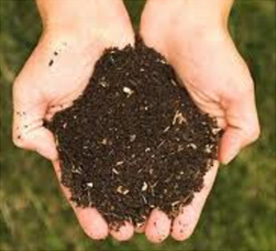 Compost can be used to fertilize plants, to aerate the soil, to provide better soil structure, to encourage soil organisms that help provide nutrients to plants, and to help hold moisture in the soil. Compost can also be used in erosion control by limiting soil loss and by promoting the growth of plants that stabilize the soil. All organic materials (anything made from once living organisms such as wood, plant materials, meat, or animal fibers) can be composted, but some may be problematic. For example, oils, fatty products and dairy products may slow the process and create odors or attract pests. Meat, bones, and seafood have their own problems as compost piles with these items can attract pests and require temperatures that exceed 131 0 F to kill pathogens that may be lurking. See the table below for more specific examples of compostable items. 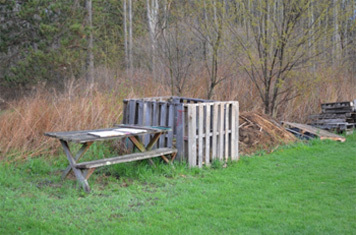 You can divide the materials you compost into “greens” and “browns.” Greens are high in nitrogen and are generally wet. Vegetables, fruit scraps, grass clippings, coffee ground and tea bags are all greens. Browns are dry and include leaves, straw, hay, woodchips, dried grass clippings and paper and provide needed carbon. Browns provide needed carbon. A general rule of thumb is to evenly mix greens and browns. The typical size of a compost pile is three by three by three feet or one cubic yard. The size needs to be based on how much material you need to recycle and how much effort you can expend maintaining the pile. Water is essential, so you should monitor moisture periodically by grabbing some material and squeezing it. If a few drops of water fall, that should be sufficient. More and the pile is too wet; and less and it is too dry. One advantage of a closed bin is that the cover will limit water input from precipitation. Alternatively you can cover your open pile. In either case the piles should be well drained. Air is essential as the organisms that are doing the composting need air to survive. If the pile becomes too dense or wet, those organisms die and organisms that can function in low or no oxygen conditions thrive. Decomposition slows and the pile will begin to smell. The pile needs to be turned weekly or as needed using a fork or your hands or whatever tool is best for you. There are many of organisms involved in composting including nematodes, springtails various mites, earthworms, millipedes, bacteria and fungi. They all need materials, air, water and the right temperature to thrive. Larger Scale Composting: In 2012, the Vermont Legislature passed Act 148, which will dramatically reduce the amount and types of materials sent to landfills. Between now and 2020, there will be a gradually phased-in process of management of leaf and yard wastes, and food residuals, at certified facilities. This phased process requires large generators (>104 tons/year) to divert such wastes by 2014. Ultimately everyone will be doing so by 2020. Composting at home will greatly help residents to meet this goal. Commercial facilities will need to come online to serve businesses, schools, government agencies and those who can’t compost at home. For more information on Act 148, visit this website. Common problems include odor and pests. The table below provides some solutions. 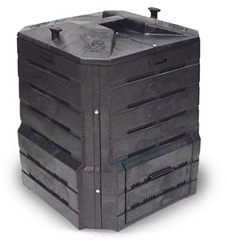 The following are some web sites that offer more information on composting. CalRecycle. Backyard composting – Great site on composting and other gardening and landscaping tips. Chittenden Solid Waste District. Backyard composting – This site describes how to get into composting in six steps. CSWD also offers workshops on backyard composting. Cornell Waste Management Institute – This is a great site with materials one can download on composting. Master Composter – This site provides guidance on the basics of composting, how to get started and how to build your first compost pile. University of Illinois Extension. 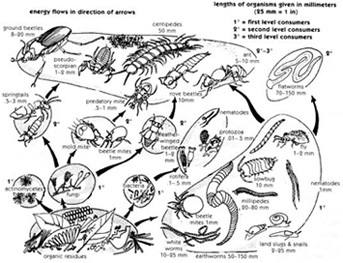 The science of composting – Great site on what organisms are busy creating compost. USEPA, Composting for facilities basics – These sites have a wealth of information ranging from home composting to larger scale facility operations. Vermont Agency of Natural Resources Composting – You can find more information on composting operations, rules and regulations in Vermont as well as links to informational sites.